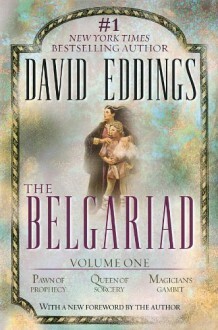 Millions of readers have discovered the magic of David Eddings’ New York Times bestselling series The Belgariad. Now the first three books in this monumental epic appear in a single volume. Here, long-time fans can rediscover the wonder—and the uninitiated can embark upon a thrilling new journey of fantasy and adventure.It all begins with the theft of the Orb that for so long protected the West from an evil god. As long as the Orb was at Riva, the prophecy went, its people would be safe from this corrupting power. Garion, a simple farm boy, is familiar with the legend of the Orb, but skeptical in matters of magic. Until, through a twist of fate, he learns not only that the story of the Orb is true, but that he must set out on a quest of unparalleled magic and danger to help recover it. For Garion is a child of destiny, and fate itself is leading him far from his home, sweeping him irrevocably toward a distant tower—and a cataclysmic confrontation with a master of the darkest magic.